sport enshrined his iconic number 3 car and his racing legacy with a worship and reverence never before seen in the sport of car racing. Fascinated by the response of the media and the fans to Earnhardt's death-and grieving himself over such an untimely loss-L.D. Russell began exploring the deep attraction to cars, tracks, and speed driving fan's love of stock car racing and their adulation of Earnhardt. 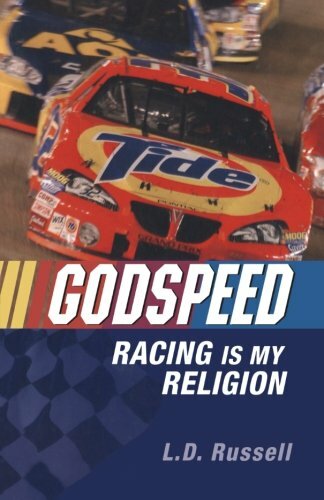 Godspeed records Russell's visits to rural race tracks, to races at Darlington Raceway, Bristol Motor Speedway, Lowe's Motor Speedway, and Richmond International Raceway, and his conversations with NASCAR chaplains and fans about their love of the sport. Russell weaves his own refl ections on the meaning of speed, death, and religion into a colorful story that covers the thrill and agony of racing as well as its tremendous popularity. Over the last decade, NASCAR has become the fastest-growing spectator sport in America. First, this phenomenon indicates that the sport has moved well beyond its Southern blue-collar roots to capture the hearts and souls of Americans at every socioeconomic level. Second, the mourning over Earnhardt indicates that at its deepest level NASCAR, like every religion, satisfi es a basic human need: it is at the same time a celebration of life and a way of dealing with death. For seasoned NASCAR fans, Godspeed offers reflections on the history of racing and the lore and legends of the sport. For fi rst-time fans, the book provides an in-depth look at the reasons that so many are attracted to the roar of engines and possibility of witnessing death on a Sunday afternoon at the track. For the uninitiated, Godspeed offers an absorbing introduction to enthralling appeal of car racing. Russell looks at both the intangible and tangible rewards that NASCAR offers its followers, as well as the ways it meets its followers' needs, particularly in the experience of transcending life's limitations. For anyone who's ever been spellbound by the electrifying power of speeding cars hurtling hellbound toward a checkered flag, Godspeed takes you behind the wheel to experience the exhilarating thrills of NASCAR and its tremendous existential appeal.